HORACIO MANUEL CARTES JARA, President of Paraguay, said he had taken office less than a month ago following an exemplary electoral process that culminated with elections on 21 April which were certified as legitimate and fair by United Nations observer missions and several regional and hemispheric organizations. He stated that institutionalism, consensus building, democracy and respect for human rights and free speech were the cornerstones of his Administration. He had set poverty alleviation and social investment as top priorities so that Paraguay’s people would become engines of the country’s development, he said. His Administration, he said, had zero tolerance for corruption. He noted that Paraguay’s macroeconomic indicators were encouraging, adding that the country was suitable for investment given its abundant and fertile soil, large freshwater reserves, and clean, renewable energy generated by three hydroelectric power plants. He said that the Government was committed to providing legal security and clear and transparent rules to safeguard people and their property. A few weeks ago, he noted, he signed the “Agreement for Paraguay” with various political parties in Congress, as well as with other institutions, to work together on strengthening governance and improving people’s well-being. His Administration, he said, was committed to defend and promote human rights. 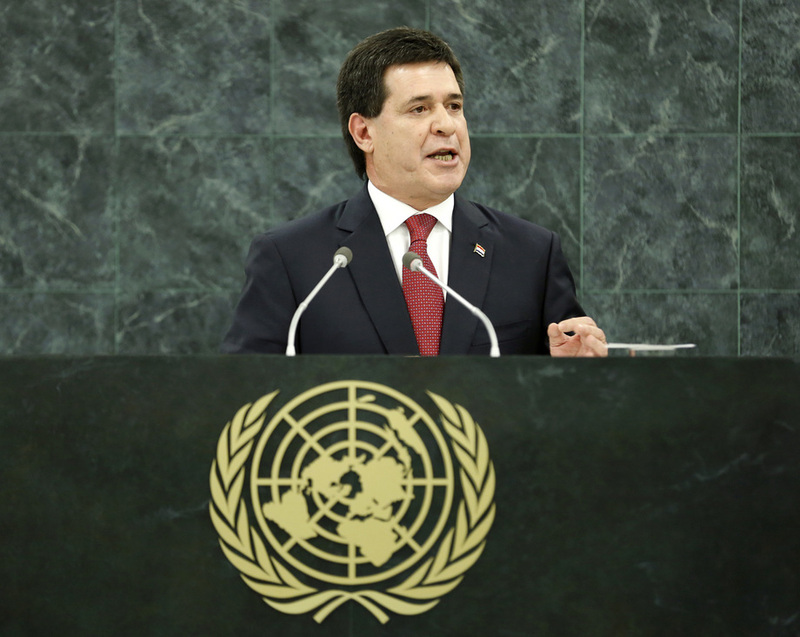 He said that the special needs of Paraguay and other landlocked countries must be addressed adequately. Paraguay’s longstanding border dispute with Brazil, he added, had given way to creation of the Itaipu Dam, successfully transforming a problem into successful cross-border integration and development. He noted that Paraguay was determined to enhance communications, logistics and infrastructure to better connect beyond its borders. He expressed concern over the events in Syria, noting that the Organization must play a preeminent role in resolving the conflict. In that regard, he called for support for implementing the United States-Russian Federation framework agreement. He hailed the fact that Taiwan had increased its presence in United Nations specialized agencies and bodies thanks to strong global support. He said that his Administration would continue to encourage such positive interaction. He encouraged peace, dialogue and harmonious global development and respect for the rule of law. He noted that integration was vital. He added that Paraguay aimed to become a land of opportunity, investment, prosperity, security and reliability. Improving education, he said, was a top Government priority as it was a means to overcome the geopolitical constraints of backwardness.